In an unusual trend, a new price cap system that is being imposed by Sub City Trade and Industry Bureaus in Addis Abeba is leading to “immense scarcity and price increase” of food stuffs mainly cereals and vegetables in the City. The price of Ethiopia’s staple food, Teff has peaked suddenly to 2500 birr. Merchants blame ‘producers’ for the sudden hike. In the past few days, most Trade and Industry Bureaus under the Addis Abeba City Administration have been imposing new price caps on vegetables and cereals in main markets. The cause for the imposition is yet unclear. 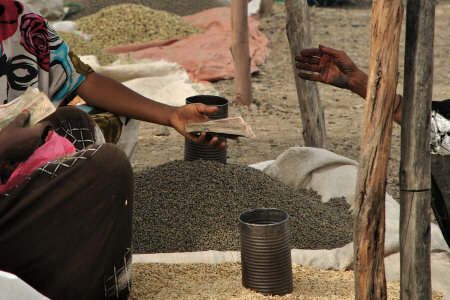 Following the new price caps merchants and wholesalers in most Addis Abeba markets have increased the price. Vegetables have been unavailable in country’s biggest veg and fruit market, Atikelt Tera due to the new cap scheme. For instance although the price cap for onion has been set at 12 birr/kilo, merchants have been selling it between 17 to 19 birr. Similarly although the price cap of Ethiopia’s staple food, Teff has been set at an average of 1300birr (ranging on qualities), it was being sold at around 1800 birr. With a new price cap introduced this past few days, the cap has been increased by 300 birr to 1600birr in Addis Abeba and following this cereal traders in Mesalemya and Ehel Bereneda in Addis Abeba rose the price up to 2500birr. Authorities have reportedly began locking some of the businesses that are not abiding by the new scales. It is to be recalled that the Ethiopian regime officially did cap prices on several imported and domestic commodities “in an effort to ease inflationary pressures” in January 2011 and was lifted in June 2011. Reuters reported on Sep. 04, 2012 that Ethiopian year-on-year inflation edged up to 20.2 percent in August from 20.0 percent a month earlier and food inflation slowed to 20.4 percent while non-food inflation rose to 19.8 percent from 19 percent previously, according to the Ethiopian Central Statistics Agency. However, in aggregate the inflationary rate has showed an increase. The price cap notices that were being posted in the shops are now being removed by dictrict officials to be replaced with new caps. De Birhan will post the new notices as soon as they are posted once again.